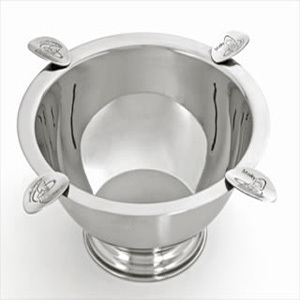 Stinky Cigar Ashtray is 8 inch round 3 inch deep dish stainless steel bowl. Cleans up easily with most household cleaners to maintain its polished luster, ideal for indoor and outdoor use. Welded to the bowl's rim are four oval-shaped metal objects called cigar stirrups that look like coins that were steamrolled and bent upright. The deep dish design is intended to provide more room to dispose of multiple cigars and other related debris such as cedar sleeves or cellophane without overflow and without having to empty the bowl to clear the way for another round of smokes. The stirrups keep the ensuing cigars secure, level and above the refuse in the bowl.